The Faculty Journal is currently being used for family weekend, end of semester, St. Mark’s Saturdays, and Lion Term“bullet point” comments. Please refrain from any other possible uses until a fuller conversation about how we use the Faculty Journal has taken place. Comments show who wrote them and when, but not why or for what. You need to be very clear in your title and content. Comments cannot be edited after the fact. They can only be deleted. Comments can only be deleted by the teacher who wrote them. You cannot print or copy-and-paste Faculty Journal comments. 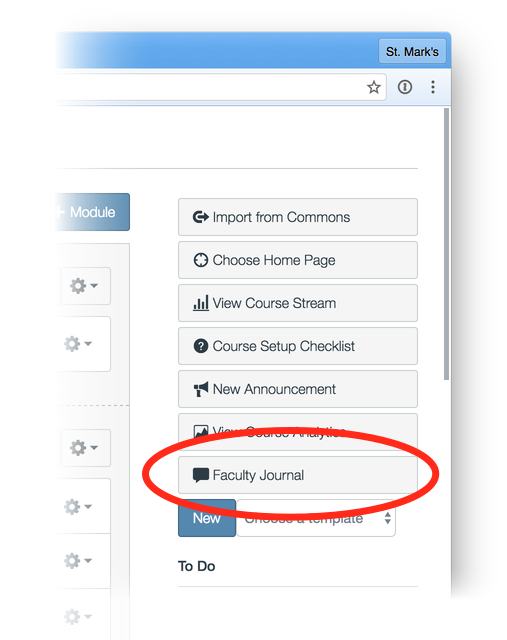 Click the Faculty Journal button on the right side of your course home page (or at the bottom, if you have have an itty-bitty narrow screen). You will be looking at the first student in your class. Click Create a New Entry in the right-hand sidebar to start writing. Write. Be sure to give your comment a meaningful title (include the name of your course and a reference to Family Weekend 2013, e.g. “Algebra II (FW 2014)”). Click the Create Entry button to save your comment. 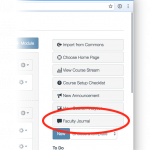 Navigate between students in your class using the menu and arrows at the top of the Faculty Journal. Click the Faculty Journal button on the right side of your advisory group course home page (or at the bottom, if you have an itty-bitty narrow screen), as if you were going to enter comments. Navigate between students in your advisory group using the menu and arrows at the top of the Faculty Journal. This entry was posted in Faculty and tagged Canvas, comments, Faculty Journal, bullet, point.